My name is Rachel. I am a junior at Baraboo High School, in Baraboo, Wisconsin. I was an honor roll student during my middle school years, and have been on high honor roll throughout high school. With hard work and determination I plan to maintain excellent grades. As long as I can remember, my dream has been to play college hockey. The first team I played on was a U-14 girls team when I was nine years old. I then continued to play for girls hockey teams, including: Badger Lightning U12 and U14, Madison Stars, Western Wisconsin Blue Devil's, Jr. Badgers U14 Major, Wisconsin Selects, Team Central, and Team Wisconsin. On any team I have played for, I have played with my heart and soul, bringing motivation and a positive "give it your all" attitude. 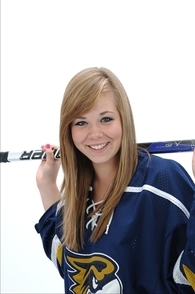 I will continue this passion for hockey with any team I play for in the future. It is my goal to play hockey at the collegiate level while following my academic dreams as well. I am psyched to see what college my dreams and goals lead me to.